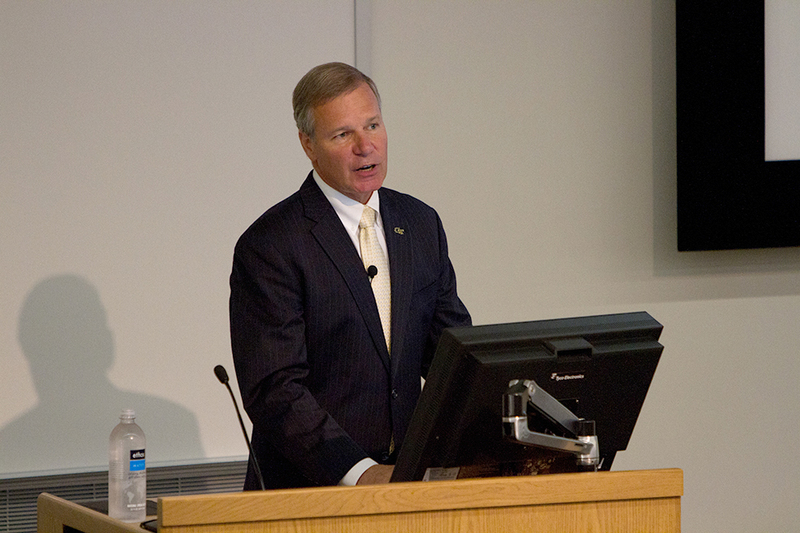 On August 28, 2014, President G. P. “Bud” Peterson delivered his annual Institute Address. The president not only discussed his plans for the future but also reflected on the five years since he became President. “Through a culture of collaboration, innovation, and leadership, we are expanding our influence—in our state, our region, our nation and our world,” Peterson said. Peterson mentioned both increased international cooperation between higher education institutions and interdisciplinary research initiatives. “We’re one of the world’s most globalized technological research universities,” Peterson said. One of the newest international partnerships is with Tianjin University, where Tech is now part of Shenzhen Virtual University Campus. At the campus in China, students can complete a Master’s degree in Electrical and Computer Engineering from Tech. Additionally, this past May, the Lafayette Institute was launched on the Georgia Tech Lorraine campus, where full time masters and graduate students can conduct research in nanotechnology. “This new facility will provide the resources and the equipment that they need to make leading-edge breakthroughs,” Peterson said. Peterson also said that research is being done beyond campus grounds, like a $20 million collaboration with Children’s Healthcare of Atlanta to create medicine specifically for children’s immune system. The newest expansion of Tech’s interdisciplinary research is the construction of the Engineered Biosystems Building. Research will be done in human health, and commercial initiatives in this area, scheduled to open in June 2015. “[Tech Square] is a vibrant, exciting place today with new companies moving in every day,” said Peterson. A business outreach institution, EI Squared, has created more than 513 jobs and made $100 million investments and businesses under its start-up incubator. Advanced Technology Development Center (ATDC) has created 5500 jobs and reported revenues of at least $1.3 billion. According to Peterson, Tech is about to undergo the process of SACS accreditation from the Southern Association of Colleges and Schools Commission on Colleges (SACSCOC), which decides whether institutions of higher learning in the South are still eligible to grant academic credit. As a part of the process, Tech will have to submit a Quality Enhancement Plan (QEP) which is a funded mandate that will be implemented within 5 and 10 years. The QEP of the last decade focused on increasing undergraduate research and study abroad opportunities. “Our QEP will focus on the combination of sustainability, experiential learning [expansion of MOOC courses and online learning] and community engagement,“ Peterson said. He noted that since the study abroad and undergraduate research programs have become more popular, these new initiatives could have a similar impact.